I've decided to take my collection in a different direction. My new goal is to get one playing-days card of each Japanese hall of famer. It's been exciting so far, as it provides an opportunity to learn not just about new sets of baseball cards, but an entirely new world of baseball. Anyhow, I'd like to document this project. We have pick-up threads, but this is different enough that I thought it might merit its own thread. The plan is to post a picture of each card and a little bit of history about the player pictured to give you, dear reader, an idea of who this guy is and his place in Japanese baseball. The tread is on this side of the board because professional Japanese baseball didn't start until 1936, and although there are pre-war Japanese cards (which I'll have to track down eventually) they are very rare. We'll start with these two guys. On the right is Kazuhisa Inao. He pitched from 1956 to 1969 for the Nishitetsu Lions. All Japanese teams are owned by corporations, and they are identified by the name of the company that owns them and then their nickname. Nishitetsu is the national Japanese railroad. The team plays in Fukuoka, down on the southern end of Japan. Inao had a relatively short career, but few were better than he was at his peak. He's sort of the Japanese Sandy Koufax. He won 42 games in 1961, pitching more than 400 innings. He surpassed 30 wins several other seasons. He set a record with a 1.06 ERA as a rookie and won 20 consecutive games in 1957. On the left is Takehiko Bessho. Bessho played from 1942 to 1960, taking a couple years out for the war. He spent most of his career with the Yomiuri Giants. It's hard to over-state how dominant the Giants were up until the 1980s. They were like the Yankees only more so. At one point they won the Japan series nine consecutive years, and have won the series 22 times in total. (It was first held in 1950.) He won 310 games, fifth all-time according to Baseball Guru (although parts of their website are out of date and this one may be as well). He wasn't quite as good as Inao, but he had a longer career and was one of the greatest pitchers in Japanese history. The card itself is a menko card. Menko is a card-flipping game. The idea would be familiar to American kids, although menko has been around for centuries. You can find menko cards featuring all sorts of things, athletes, animals, cars, and many others. Menko cards tend to be colorful with lots of designs that are intended to appeal to kids. Early menko cards had these designs on the fronts of the cards, by the 1950s the designs were relegated to the back. 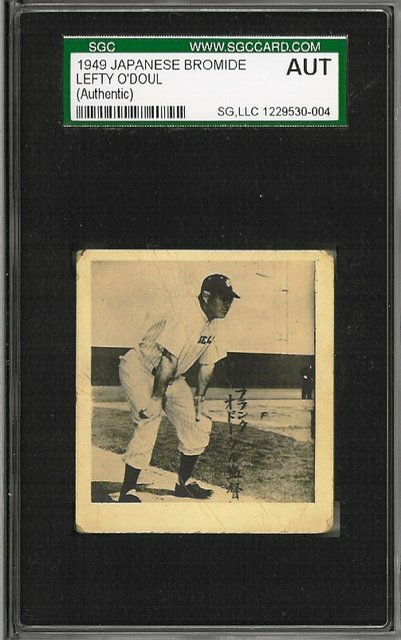 The set is catalogued as JCM 28a and was issued in 1957 (so this is Inao's rookie card). There were hundreds of sets of menko cards made, but relatively few of each one (either that or they didn't survive at a very high rate). Gary Engel, who literally wrote the book on Japanese baseball cards, says that this set is relatively uncommon, with around 100 to 250 examples of each card known. I'll post more cards later. Last edited by nat; 05-08-2018 at 02:05 PM. I love the casual note for Bessho where he took a couple years off for the war....TO TRY AND KILL US!!!!!! Nice!!! I am starting to get interested in Japanese cards...and have a few I have acquired over the years. I grew up in Japan until I was 10 yrs old and it was during the glory days of Oh and Nagashima's Giants so I got to actually seem them play as a youngster. Didn't collect them though (except for some menko cards) until I came to the US and discovered MLB cards. I don't know if you can get one of all HOF... I'm not up on all of the cards issued, but if you can find one of Eiji Sawamura of the Yomiuri Giants. that will be something. I don't believe there is one. He was killed in WW2, and at age 17 of course he gained fame when struck out Babe Ruth and Gehrig at an exhibition game. The Japanese Cy Young Award equivalent is named in his honor. Well, to be fair, Bessho was stationed in China, and then re-deployed to the home islands. But, eh. It's still an ideal to shoot for. Anyway, next up is Noburo Akiyama. Akiyama was a good pitcher on a bad team with a short career. He pitched for the Taiyo Whales from 1956 to 1967. This card is from the same set as the last one, so this is also his rookie card. He was a workhorse early in his career, reportedly throwing 1000 pitch training sessions in college. He was certainly a good pitchers (career ERA 2.60, although I'm pretty sure in a lower run-scoring environment than we're used to), but only briefly a great one. And he managed just under 3000 IP for his career. Sort of a peculiar choice for the hall of fame - it would be sort of like electing Roy Oswalt - but the American hall of fame also has plenty of questionable inductees. I live in Japan and collect Japanese vintage cards too (I'm more of a set builder, working on stuff from the 70s mostly these days). Its nice to see others are collecting them too! Menko are amazing, its one of the vintage card collecting areas where Japan has something totally unique in comparison with the US. Last edited by seanofjapan; 05-08-2018 at 08:31 PM. I checked out your link. Looks great! I am trying to slowly track down some cards...esp the early 70's Kalbee's of some of my favorite players. Is there check lists for those issues? I know some sets are huge. I have been collecting Japanese cards since the late 1970s, and it is very enjoyable to learn about their players, teams and history. Ricky- if you need help with Calbee checklists just let me know, I have them all. Sean- thanks for getting me that 1976 Calbee Matty Alou "Lions vs. Braves" card and sending it to our friend Jay Shelton. Nat- your knowledge of Japanese cards and baseball sounds pretty good for someone just starting out. If any of you need help or information, just let me know. I love to share my knowledge and learn from others. And yeah, the sets from the mid-70s are huge. I'm working on the 1975-76 Calbee set right now and it has 1472 cards! And some series of it were only issued in single cities (two series in Hiroshima, one in Nagoya) so they are extremely hard to find, (kind of like if part of the 1972 Topps set was only sold in Cleveland and another only sold in Denver). Its got to be one of the most difficult sets in the world to put together (though fortunately prices don't reflect this for the most part). Last edited by seanofjapan; 05-09-2018 at 02:41 AM. Hi, Jay is great, we've been trading back and forth for a couple years now, he sends me Expos card, I send him Japanese stuff! I love that Alou card, glad you like it too! Last edited by seanofjapan; 05-09-2018 at 02:36 AM. First, I'd like to start by recommending Sean's blog. It was one of the first things that I encountered when I started getting interested in Japanese cards. Second, do you folks read kanji? I took Japanese in high school years and years ago, but (1) it's pretty rusty at this point, and (2) I never did learn to read kanji. One of the most challenging things about collecting these cards has been trying to figure out who is on them. (Sometimes sellers will tell you, sometimes not. Often they just provide the last name.) I've been doing it through a combination of drawing kanji in google translate, checking baseball-reference to see if the player that I'm looking for was on the team he's shown with on the card, and checking Engel's book (which sometimes only lists last names). It's slow going, especially the google translate bit. Third, here's another card. Same set as the first two. Bessho is again on the left, next to him is Futoshi Nakanishi. I get the feeling that after they took the picture of Bessho with Inao the photographer just grabbed Nakanishi for another shot. Nakanishi played 1952 to 1969 with the Lions. He was a third baseman who, when he was young, looked like he was going to be one of the best ever. A slugging percentage over .600 for a 20 year old is pretty impressive. He led the league in home runs for four straight years. When this card was issued he was at the top of his game, a hugely successful slugging third baseman, his team had just won the Japan series, and he had just gotten married - to his manager's daughter. But it wasn't to last. In 1959 he suffered the first of a string of injuries from which he never recovered. He never played a full season again, although he did take over managing his team when he was just 29.
domo arigato for the information Sean! I will check it out. I can understand a little... if you have any that need translating I maybe able to help! Moving on from menko cards for a while. This is a bromide. Bromides were sold as baseball cards, one at a time. It's printed on thin stock, and is, maddeningly, very slightly too large to fit into a binder page. The set is catalogued as JBR 16, and Engel says that it is fairly rare: only double digits of each card known to exist. The backs are blank, but mine has a stamp on it. Google translate tells me that the stamp says "one piece", which doesn't make any sense, so anyone with more insight is welcome to fill me in. The player is Takao Kajimoto, who has got to be unique in that he both (1) is a pitcher in the hall of fame and (2) has a losing record for his career. Just barely, I grant, but 254-255 is still a losing record. He played for the Hankyu Braves from 1954 to 1973. He did win the pennant at one point, but, as you might expect, the Braves were pretty bad for much of his career. He was a 12-time all star, and the first Japanese pitcher to clear 2000 strike outs. In 1991 Baseball Magazine decided to issue American-style baseball cards. Their sets would be of a design and composition familiar to Americans, and sold in packs, like American cards. They were (and are) a hit. I'm not usually a fan of shiny modern cards - check out my avatar for my favorite era of American cards - but there's no way to get around it for modern players. Kids just don't play menko like they used to. This is a Masaki Saito from the 1993 BBM set. Unlike the earlier cards that I've posted, these are very very very common. This one cost me $1. Saito was a first-round draft pick, pitching for the Giants from 1984 to 2001. He was inducted into the hall of fame in 2016. He began his career as a reliever/swing-man, but over time transitioned into one of the great pitchers of the 1990s. He won the Sawamura award three times, tying a record. (The Sawamura award is given to the best pitcher in the league, although they reserve the right to not award it in any given year if they think that no one is up to their standards that year - which has happened a couple times.) He was also, apparently, a very good fielder, winning several gold gloves. You wouldn't think that pitcher fielding matters a whole lot, but ask the 2006 Tigers about that. Just looking at his career numbers, Saito looks like an odd hall of fame choice. 2300 innings isn't much. Roy Halladay, who will probably get elected but who is an interesting test-case for short-career pitchers in America, got up to 2700 innings. I suspect that I need to spend more time with Japanese record books to get a better feel for the context. Maybe in the modern Japanese game 2300 innings isn't so bad. I can read kanji, but I've lived here for almost 20 years and it took some work. With player name recognition it is best to concentrate on the learning the kanji in last names since (with some exceptions) they tend to use more common ones (中、山、西 etc) while first names are way more idiosyncratic and use a lot of obscure ones with weird readings. I can definitely help with reading names if anyone has questions about them. One potential shortcut which I have found helpful (sometimes I don't know how to read the kanji on a player's name since they have multiple readings) is to use the Japanese wikipedia page which has the list of players for each team. So if you get a card of a player from the Hawks for example (https://ja.wikipedia.org/wiki/福岡ソフトバンクホークスの選手一覧 ) , you can scroll through and look for the kanji (easiest way is to just look for the first kanji in the name), click on the player's name when you find it, then click over to the English Wikipedia page and you've found your guy! I suspect that I need to spend more time with Japanese record books to get a better feel for the context. Maybe in the modern Japanese game 2300 innings isn't so bad. One thing with career stats is that owing to the shorter season Japanese stars usually have lower totals in comparison with their American counterparts (which makes Sadaharu Oh's career home run total so insane). So 2,000 hits is the de facto standard for HOF consideration rather than 3,000, etc. Not sure if that was the case with Saito, he had a sort of Sandy Koufax like period of brief but exceptional dominance in the late 80s-early 90s. Both Sean and Jeff Alcorn can certainly translate for you. Jeff is a good friend who is one of the "pioneers" of Japanese baseball card collecting here in the U.S. His knowledge is vast and highly recommended. Collecting Japanese baseball cards is a lot of fun, both in the hunt and history. Picking up Gary Engel's books are a definite must (although better used as a history guide and checklist instead of card valuation prices). Robert Klevens is also a great resource and owns Prestige Collectibles and is also a member here on the forum. I started collecting Japanese baseball cards in 1980 when a mutual friend brought back some 1978 Yamakatsu cards for me from Japan (I have since finished the set). Koji Akiyama played outfield for the Lions and the Hawks over a 20 year career. He surpassed 2000 career hits as well as 400 home runs. He also spent one season, very early in his career, with the San Jose Bees, at the time an unaffiliated class A team. He was a flashy and dramatic player, doing, among other things, a backflip onto home plate after hitting a key home run in the Japan Series. He was also fast, turning in three 30-30 seasons. Superficially his statistics look like those of a young Jose Canseco, but this probably sells him short. For one thing, he was always better at getting on base than Canseco was. The Lions were the dominant team of the late 80s and early 90s. The won the pennant many times. After an off year at age 31 (albeit one in which he still slugged >.500) he was traded to the Daiei Hawks. Edited to add: I have Engel's book on vintage cards. It's really good as a guide and checklist, but you're right, the prices are... not helpful. I know about Prestige Collectables, but haven't bid in any of their auctions. I'll look into the next one. Last edited by nat; 05-10-2018 at 01:54 PM. Akiyama is great, he was also the best manager in NPB (IMO) for several years, though for some reason he retired quite young. I lived in Fukuoka when he was the Hawks manager (taking over after Sadaharu Oh retired) and watching his teams play was the most exciting time I've ever had as a baseball fan as they were constantly dominating the PL and won the Japan Series in his final season. He also arguably had the best hair of any player to ever take the field. I'm not a BBM collector but I have to admit to liking the colorful designs of that 1993 set. Last edited by seanofjapan; 05-10-2018 at 11:59 PM. It's great having people around who have actually seen these guys. To me they are names on a baseball card (or a list of stats), but I would certainly have liked to have seen them play. One more BBM card and then we'll go back to vintage. This is Tsutomu Ito. He had a very long career, and so managed to accumulate some respectable career numbers, but he really wasn't much of a hitter. A career slash line of 247/319/363 does not strike fear into the heart of opposing pitchers. He was a great defensive catcher, however, and his defense got him sixteen all-star selections. I don't think that someone like this would make the American hall of fame. We do have hall of famers who are there primarily for their defense, but the only one who was consistently below-average as a hitter was Bill Mazeroski, and he (1) was the greatest defensive player ever at his position, (2) had a really famous home run, and (3) was such an embarrassing mistake that they reformed the veteran's committee afterwards to make sure that a mistake like this doesn't happen again. Also, I don't have any idea what 'affluent nineteen' means. That is a reference to the text on the back of the card, which is entirely about how much money he gets paid (I think this must have been part of a subset). The top text in the text box says 100 Million Yen Player and it goes on to say that he was the first catcher in NPB history to be paid 100 Million yen per year. That is about 900,000 US$, so even by 1993 standards the players here weren't getting quite the insane MLB rates, but I think he can definitely be called affluent! 868 HRs. 9 MVPs. 13 consecutive HR titles. His autobiography is dedicated to his hitting coach. Sadaharu Oh was the greatest player in the history of Japanese baseball. The card itself is from the enormous 1975/76 Calbee set that Sean is working on. (Sean, if you need this one I’ll trade it for another Oh card.) Menko/bromide production tailed off significantly in the late 1960s. Through the 1970s and 1980s Calbee was, basically, the only show in town. Calbee cards were inserted into envelopes and attached to the outside of bags of potato chips. Calbee also makes little toasted veggie snack things that my wife loves. I've got nice cards of Kawakami (nickname "The God of Batting"), Harimoto (only 3,000 hits member), and Victor Starrfin somewhere. 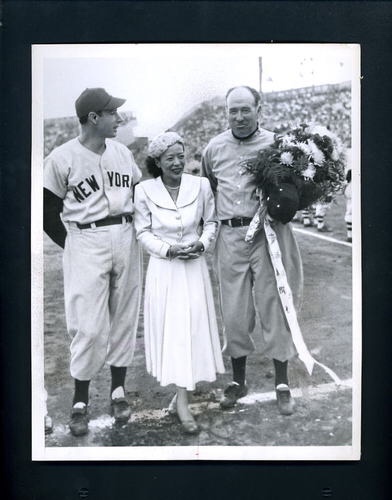 and I have a really spiffy 1950 tour 8 x 10 bromide of Dom DiMaggio somewhere too. Last edited by Exhibitman; 05-15-2018 at 02:33 PM. Great cards Adam! The quality of the images on the JG2s is excellent, but I especially like the O'Doul/DiMaggio card. well, when in Rome, er, Tokyo. There are Japanese O'Doul cards so I think you have to go that route. That's free advice and it is worth every dime you pay for it. Awesome card! Thanks for the offer, though I already have that one. I haven't counted but Oh appears in probably 80 or 90 cards in that set (which is another thing to like about it!) I recently sorted my set and found I had a few Oh doubles if you (or anyone) is interested in a trade! Adam - those cards are beautiful! Last edited by seanofjapan; 05-15-2018 at 10:03 PM. Is that O'Doul/DiMaggio card supposed to have cut corners? Kinugasa is most famous for his consecutive games-played streak. He didn't miss a game for 17 years. He began his career (in 1965) at first base, and moved to third in 1975. (Moving up the defensive spectrum is quite unusual.) He spent his entire career with the Hiroshima Toyo Carp, retiring in 1987. Amazingly, when he retired his consecutive games-played streak was still intact. He surpassed Gehrig, although Ripken would later pass him. Kinugasa rarely led the league in anything, and didn't make any best-nines until late in his career (since he was usually blocked by Oh or Nagashima). He was, however, often among the league leaders in many offensive categories, and places in the top 10 or so in many career statistics. His style was aggressive; he was a big slugger (504 career home runs) famous for a max-effort style of swing. Inevitably mentioned in (western) Kinugasa biographies (of which this is one, so here's the mention), Kinugasa's father was an African American service man. He left the family when the future ball-player was young, and he was raised by his mother. Kinugasa's nickname was 'Ironman'. One would think that the reasoning behind it was obvious, but the ever-reliable Wikipedia claims that it was taken from a manga. He died less than a month ago. This is also a Calbee card, although somewhat newer than the Oh posted above. This one is from 1982. Calbee cards tend to be slightly smaller than American cards, but for a while in the 80s they made them very small. This one is Goudey-sized or smaller. I've only seen them with corners cut. I have no idea, though. Mine was pasted to notebook paper too. Great card. As a posthumous tribute to him, NHK Japan recently re ran his documentary from the time he was pursuing his ironman streak. Along with Koji Yamamoto he was the mainstay of those great Carp teams. Let's continue with the Carp. Ohno was Kinugasa's teammate for about ten years. He's another lifetime Carp, pitching for them from 1977 (when retired only one batter but gave up five ER) to 1998. He's got an absurd winning percentage: .597. Just for some perspective, an American team with a .597 winning percentage would end up with a record of 96-66. Pretty good. He was a Sawamura award winner and 10-time all-star. I'm not sure why, but in 1991 the Carp decided that he should be a relief pitcher, and he started striking out everybody and their brother. His K/9 rate jumped from an already-respectable 8.5 to 11.3. In 1995, as a 39 year old, he returned to being a starting pitcher. His career, therefore, has something like the shape of John Smoltz'. I just noticed, look at that grip. Did Ohno throw a knuckleball? Also, let's talk about intellectual property for a minute here. I realize that Cincinnati and Hiroshima are a long distance apart, but surely the Reds have a lawyer filing lawsuits any time the Carp try to sell gear or licensed merch over here. Admittedly this doesn't happen much, but I had a Kintetsu Buffalos cap when I was a kid, so I imagine there are some Carp hats out there somewhere. They might. Trademarks are territorial so its not a problem for the Carp to use the same logo as the Reds in Japan, but if they sell that in the US they would run afoul of Cincinnati's TM. I'm guessing they might have some sort of arrangement worked out to avoid disputes (and also to sell Reds stuff in Japan, where it could be in breach of the Carp's trademark). A lot of the older teams here have uniforms, etc obviously modelled off of MLB teams (Tigers, Giants, Dragons) but its only the Carp which has the same initial as their US counterpart! They were teammates for years, and played for the most successful team in history during it's most successful period in history. Forever linked as a part of the ON-Cannon. Nagashima was a gold-glove third-baseman (and in that was different than Gehrig), who hit 444 home runs and collected close to 2500 hits. He is probably a top-5 player all-time in Japan. Jim Albright ranks him 3rd over all. He was a five-time MVP and a best nine player every season of his career. (So, in context, he was better than Gehrig.) The Giants of the 1960s were just beyond belief. The place where the Gehrig analogy really breaks down is in their respective roles in the broader culture. Oh was the better player, but not the bigger star. It's worth noting that the #1 (and #2, and #3, and so on) cards in the inaugural Calbee set were all of Nagashima. He is Japan's most beloved baseball player. He played for the Giants from 1958 to 1974, and took over managing the team after his retirement. I had a friend read it for me, but at this point I've encountered it often enough to know what 巨人 means. I'm more interested in the older cards, but Kudoh is also a hall of famer, so he gets his moment in the sun (I'm sure he's thrilled by the honor). Kimiyasu Kudoh was a star pitcher for a bunch of teams from 1982 to 2010. That's right, 29 years. If I lived in Japan, I suspect that he'd be one of my favorite players. I love players who have strange careers, and a 29 year career counts. Kudoh appeared in the Japan Series 14 times, and although he won an MVP award he never won the Sawamura award. He first rose to prominence with the Seibu Lions, leaving in 1994 as a 31 year old. He would return in 2010 to pitch his final season (well, his final six innings) at age 47. I suspect that this was a sentimental, "retire as a Lion" sort of thing. Despite the exceptionally long career, he accumulated only about 3300 innings pitched (fewer than Smoltz pitched, even though Kudoh's career was eight years longer). In part this is due to the shorter Japanese season, and in part to the fact that he spent both the beginning and the end of his career as a reliever. He was a good fielder (and gold glove winner) but a hilariously inept batter. He was 22 for 272 for his career, a .081 batting average. 224-142 W/L record more than makes up for it though. Funny thing growing up as a kid in Japan, we flipped menko cards all the time with both Japanese kids and American kids (who lived in and around the US military base) and I don't recall Japanese bb players on them at all. Most if not all had cartoon characters on them. Both square and round ones. As near as I can tell they stopped making baseball menko cards in the 1960s. If you were growing up after that point there wouldn't have been any. Baseball menko cards were a late-40s to 1960s thing. Kudoh - he is the second player you listed after Koji Akiyama who went on to be a great manager of the Hawks (he is their current manager and led them to the Japan Series in 2 out of his first 3 seasons). I might buy some menko for my kids to see if I can get them into them. I have some vintage ones but have never played with them (well, I'm not going to give those to the kids, but you can still buy generic new ones pretty cheap at some shops). Last edited by seanofjapan; 05-23-2018 at 09:32 PM. There are menko like cards all across Asia. I have similar boxing cards from Malaysia and the Philippines (where they are called TEKS). Plus Bruce Lee cards from Thailand and China. Three hall of famers in this post. Next to Oshita you will see Henry “Bozo” Tadashi Wakabayashi. He pitched from 1936 to 1953, missing 1945 and 1952. He pitched for Hanshin, Osaka, and Mainichi. He’s pitching for Hanshin on this card, as it helpfully has his team name given in English. I don’t think I’ve seen any other Japanese cards this old (or even close to this old) with English on them. The writing is almost always in Kanji. Wakabayashi had a career 1.99 ERA, which is certainly impressive, but, as noted above, context is important. If the league is slugging below .400 it’s easier to post a low ERA. Wakabayashi was born in Hawaii and was one of the first members of the Japanese baseball hall of fame. Okay, he was 16th, but that’s pretty good. Grover Cleveland Alexander was the 16th member of the American hall. In fact, if you’re looking for a fair comparison with an American player, Alexander wouldn’t be your worst choice. Both relatively early pitchers with long and successful careers, although overshadowed by some of their contemporaries. (Matty, in Alexander’s case, Starffin for Wakabayashi.) He was of Japanese descent, and was recruited to play college ball in Japan when one of his teams in Hawaii visited to play the local teams. Incredibly, video of him pitching still exists. He apparently threw sidearm and had a crazy windup. The third hall of famer on this sheet is Noboru Aota, on the lower left. Aota was an outfielder who played from 1942 to 1959. He hit .355 in an abbreviated debut as a 17 year old with Tokyo. After the war he spent a couple season with Hankyu before spending the bulk of his career with the Giants and the Whales. He was a slugger with a little bit of speed; basically the same kind of player at Oshita. Indeed, there were off-field similarities too. Like Oshita, Aota had a reputation for hard living. He missed time for the war, serving in the Japanese air force, but he did not see combat. At his retirement Aota held the all-time record for home runs (265), although it would be eclipsed just four years later. The fourth player is Takeshi Doigaki. He’s not in the hall of fame, but he was a standout catcher in the post-war period. When I was a kid I always like cards of catchers – with all their armor they looked like maybe they were part insect, or part baseball-playing robot. Anyway, lots of Doigaki cards show him in his full catcher gear, unfortunately this one has only got him with his glove. Offensively he was somewhat better than average, with a Yogi Berra-like ability to avoid striking out. These cards are catalogued as JCM 75. They were issued in 1947. Engel calls them Menko cards, although I don’t really believe it. To begin with, they have neither a menko number, nor a rock-paper-scissor symbols. That may not be dispositive evidence, but it’s pretty good. On top of that, these cards are made of very thin stock. Almost a rough paper. It’s hard to imagine these flipping over once they were on the ground, and it’s even harder to imagine that anything would flip over if hit with one of these. I think it’s best to simply think of them as trading cards. The catalogue doesn’t mention the Tarzan back on the Wakabayashi card. I’ve seen two uncut sheets, however, and in both cases Wakabayashi has this back and not a “Base Ball” back, so I suspect that it’s not an unusual variation or anything. I’ve never encountered single cards from this set, only the uncut sheets, which is probably explained by the fact that the cards are very flimsy. Any that were distributed to kids would have been destroyed pretty quickly. I like the immediately post-war cards. One of the nice things about baseball cards is that they provide a connection to world that can be very different than the one that we live in. For example, Goudey cards were issued during the depths of the great depression. There’s every possibility that the Jimmie Foxx that sits comfortably ensconced in your PSA holder was some kid’s prize possession in 1934; pennies were hard to come by back then. I’m not an historian, and can’t tell you how extensive the war damage was to Japanese industry, but it was pretty extensive. Cards like these might have been the first toys produced after the fighting stopped, and one of the first signs of life getting back to normal. Makoto Kozuru was an OF/1B-type-player who played pro ball from 1942 to 1958. In the early part of his career he changed teams with some frequency. In 1953 he joined Hiroshima and spent the rest of his career there. (Baseball-reference’s bullpen section says that Carp fans took up a collection to raise money to sign him). Kozuru’s case for the hall of fame is obviously one based around peak performance. In 1950 he became the first Japanese player to hit 50 home runs in a season, and his marks in total bases (376), runs (143), and RBI (161) are still Japanese records. By contrast his career totals are rather mediocre (at least, for a hall of famer). Jim Albright ranks him as the 50th greatest player in Japanese history. He was a member of the all-star team that played against the Seals on their 1949 tour through Japan. This is my first die-cut menko card. The shape is very common for a die-cut card, and I’d always assumed that it was intended to look something like a person. But, on the other hand, I’ve seen military menko with images of battleships and the like in the same shape, so who knows. The set is not catalogued, although it bears obvious similarities to a number of late 40s sets. Fortunately it is possible to date it quite precisely, as Kozuru is wearing a Stars uniform, and 1949 was the only season that he played for them. Wow, those are great cards! I love the round glasses that seem to have been super popular in Japan in the 40s and 50s. I still don't have a Yonamine card. He's really popular (at least by the standards of vintage Japanese players), although I'm not 100% sure why. He was certainly good, but it's not like he's noticeably (or even: any) better than Oshita, or a number of other contemporary players. Is it that he was also a pro football player? That he was American probably helps explain his popularity with Americans, but it's not like he was the first. Wakabayashi, for example, pre-dated him. Hiromitsu Ohiai was the best player of the 1980s. He was a fearsome slugger who clobbered 510 home runs on the way to putting up a 311/422/564 slash line. Over 20 years he played for Lotte, Chunichi, Yomiuri, and Nippon Ham. (An aside: I know 'Nippon Ham' is the company's name and 'Fighters' is the team nickname, but it's still my favorite team name.) Ochiai had some truly amazing seasons. In 1985, for instance, he slugged .763. For some perspective, that season would rank 9th all-time in America, sandwiched between Ruth’s 1923 and Hornsby’s 1925. The only Americans to have ever posted a higher slugging percentage are Ruth, Bonds, and Gehrig. (Although, as always, context is important.) He is 12th all-time in Japan in runs scored, and 5th in RBIs. Ochiai is an all-time great. He was, however, a late bloomer. He dropped out of college and went to play in the industrial leagues, from which he was drafted by the Orions. He was not a regular until age 28, but he caught up after his late start. Ochiai was a 3-time triple crown winner (1982, 85 and 86). Here he is hitting an opposite-field home run. Beyond his great performances, Ochiai was known for his rejection of traditional Japanese baseball culture. He would skip workouts (which are notoriously rigorous in Japan), refuse coaching help, show up late to warm ups, that sort of thing. This was, apparently, something of a scandal in Japan. I think that Americans would write it off; obnoxious, sure, but we almost expect a star to be a bit of a prima donna. This card lists him as an “infielder” which is a bit generous. He started his career at second and quickly switched to third. But by 1991 he was a full-time first baseman, and would never again appear at another position. In total he played about 1500 games at 1B and 650 at third. The card is from the inaugural BBM set, in 1991. By contemporary standards it looks pretty plain, but this set was the first Japanese set to be modeled on American baseball cards, and it kicked off a period of intense innovation (with all of the parallels, inserts, etc., that you find in American cards) in the Japanese card market. YMMV on the merits of these developments. Personally I like the old menko cards the best. There are many people in the Japanese hall of fame. Most of them were not players. I didn't actually keep track, but a shockingly high percentage of the members of the Japanese hall of fame were executives. The Americans also induct executives, but not nearly to the same extent that the Japanese do. If you were vice president of the Giants for more than couple weeks, you are probably in the hall of fame. Anyhoo, I went through the list of hall of famers and sorted out those who were not primarily players. Now, the Japanese hall of fame recognizes people for play as amateurs as well as professionals, so there are some members of the hall who were stars in college but who didn't play professionally. There are some early menko issues that feature amateur players, but not many. I've never seen one. There are plenty that feature amateur teams, but that's another matter. If I can get cards of the amateur hall of fame players, that's great, and I'll buy them if I see them (and if they exist), but I'm going to treat them as extra credit. So I sorted out these folks as well. That left 87 hall of famers who are in the hall primarily for their play as professionals. Almost all of these guys played post-war (although many began their careers before the war started). These guys are my targets. Of those 87 I currently have 22 in hand (as well as several more in the mail from Japan, but I'm not going to count them until they're here). That's a little bit over 25%. I've been at this for a month and a half. Oldest cards are from 1947, and my newest are from 1993. It's nice that Japanese cards are so much less expensive than American ones. I mean, it's true that last month I went way over my regular baseball card budget, but I've still spent more on single American cards than I've spent on 1/4th of the Japanese hall of fame.